Today, we’re taking a major step forward and releasing Kinit, the first publicly available app dedicated to Kin, in the iOS App Store. This release marks another milestone in making Kin the most-used cryptocurrency in the world, as we give Apple users their first experiences earning and spending the cryptocurrency. Download it here. We released Kinit in Google Play for Android users last month. We’re happy to report that more than fifteen thousand Android users have downloaded the Kinit Beta App so far, and, together with our integration of Kin in the Kik messenger app, there are now more people using Kin than there are users on all Ethereum dApps combined! 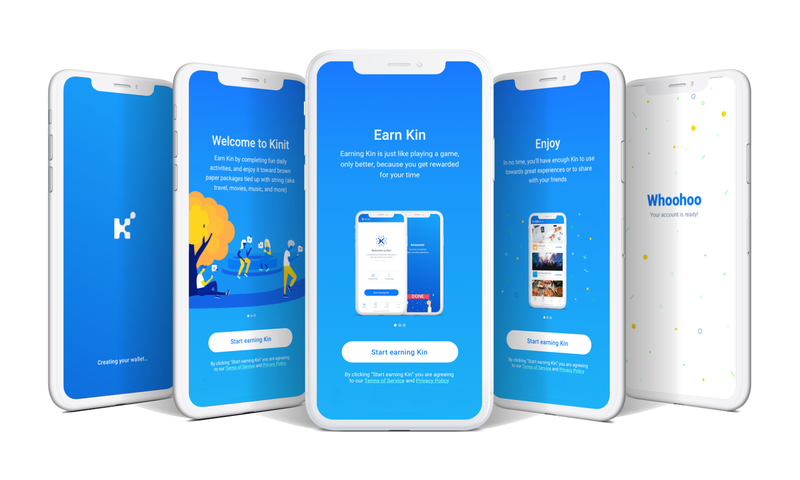 Launching Kinit in the App Store marks the first Kin experience for iPhone users, and they’ll have the opportunity to earn and spend cryptocurrency natively in an iOS app. With this release, we’ll be able to gather real insights from iOS users who transact with Kin, and possibly cryptocurrency, for the first time. This will accelerate our learnings so that our ecosystem partners can also successfully launch Kin in their apps on both iOS and Android devices. Kinit is a simple, lightweight experience with a few basic features. After downloading the app, a user will be prompted to set up their Kin wallet in a few quick steps. The user will then be able to complete a survey as their first earn experience. Other ways to earn Kin include completing quizzes and polls — some of which are sponsored by Red Bull and Swarovski through our partner Swelly, a polling chat bot. Users will then have access to the Kin Marketplace where they have the opportunity to spend the Kin they earn on gift cards from brands and retailers like Amazon, AMC Theaters, and Google Play. You’ll also be able to transfer Kin from one user to another within Kinit. Download the app to start earning and spending Kin today!